Today's New York Times has an interesting article about Medicaid in Florida. This article shows that punctuation rules are not always set in stone. The headline appears to be an apostrophe catastrophe, but copy editors at the Times would disagree. The Times makes a conscious decision to include periods and apostrophes in plural initialisms. I think it looks awkward and would prefer HMOs. What do you think? This Goodwill store in Michigan got the punctuation right on two of the four signs. Interestingly, the Spanish is correct in all four signs. 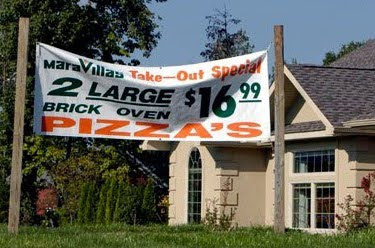 Thanks to Alan for sending in these apostrophe catastrophes. According to Alan, second-hand store sales are booming, so they ought to splurge on a proofreader. Check out his website here. 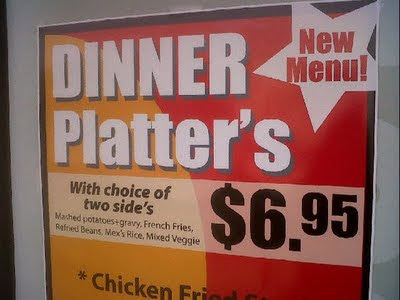 Ken spotted this double apostrophe catastrophe outside 12 Burgers and Tacos. Thanks, Ken! Check out Ken's Fake AP Stylebook here, and check out my previous Apostrophe Catastrophes entry for info on how to get a free book. What's better than the bargain's [sic] at Borders? Free books that you can win thanks to Apostrophe Catastrophes! The folks at the Fake AP Stylebook have offered free copies of Write More Good to five of my readers. I received my free copy a couple of weeks ago and have been laughing outloud. To enter the contest, simply email me photos of apostrophe catastrophes that you find in the next few weeks. At the end of May, I'll choose five winners and put you in touch with Write More Good publishers to get your free book. Unlike the chicklit featured in the photo above, Write More Good is certainly not destined for the Borders bargain section. Thanks to my friend Jodi for sending this apostrophe catastrophe from the Borders in Stamford, Conn. No wonder that chain is going out of business. Everybodys Fitness Center in Auburn, Mass., looks like a beautiful facility, but I could never work out there because its name is an apostrophe catastrophe. Speaking of the gym, I have a new favorite pilates instructor. Her next workout will be to "Judas." Oh my Gaga. I'm calling dibs on any jokes about "Pontius Pilates." Thanks to my mom for alerting me to this gym-related apostrophe catastrophe. This barber shop in Watertown, Mass., is either selling boys and old men or stating that one particular boy "is under 12." And is a "senior cut" the opposite of Justin Bieber's haircut somehow? The inconsistency and the variety of errors in this sign makes it particularly offensive. The psych major in me thinks that perhaps the person who posted this sign in a coffee shop in DC secretly wants to be a doctor. If so, he or she would have to append modifier CR to this sign. Yes, I just made a medical coding joke. I may have hit a new low. Thanks to Amy for sending in this catastrophe! 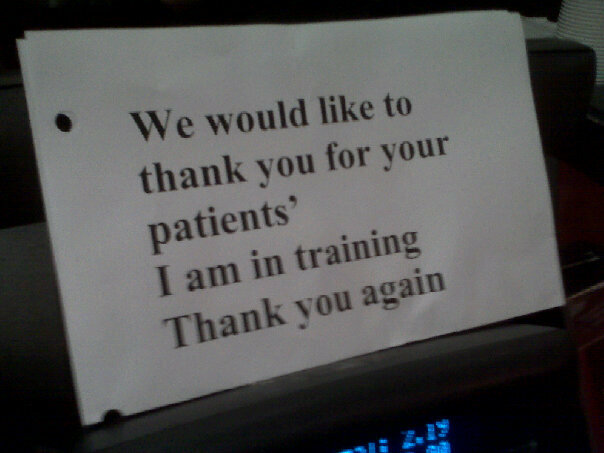 Clare sent in this horrifyingly bad sign that she spotted at her pediatrician's office. Regardless of your political views, I think we can all agree that this sign is in need of health care reform. The bad grammar and horrendous clip art might actually give someone a heart attack. P.S. Apostrophe Catastrophes has had a facebook group for a while, but now we have a page. Not sure what the difference is, but you should like us and/or join the group. 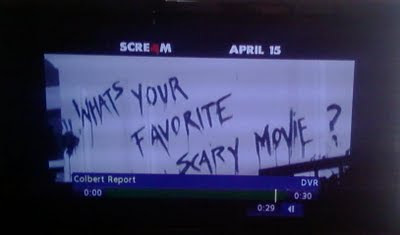 In the context of Scary Movie 4, this punctuation error may be intentional. We can't expect a serial killer to use proper punctuation, right? Regardless, the whole referencing-previous-bad-movies-so-we-don't-have-to-try-to-actually-make-a-good-movie thing seems kind of lazy. Can Hollywood try to have an original idea for once? I'll stick with watching the Colbert Report on DVR, as you can see from this photo. Isn't that punishable by caning? Thanks to Nicholina for making me feel world famous. Check out her previous Apostrophe Catastrophes submission here. He e-mailed the company to report the error and they claimed that the sign would be corrected before it was rehung in the spring. Anyone want to drive over there to check to see if they've fixed the sign?